I love my customers! Our annual Duchess Retreat is my opportunity to spoil them with inspiration, time to work on albums, no cooking, no cleaning, lots of girl time and some prezzies. My sister is my straight man, side kick, go to girl and gopher throughout the weekend. We laugh til our jaws hurt – usually over silly little things. We help each other out – teaching scrapping tricks we’ve learnt along the way. We stretch each other – trying new techniques and layouts which are sometimes out of our comfort zone. And we go out of our way to positively affirm each other. At the close of the weekend a ‘Crowning Ceremony’ is held. When this finished this year my sister and I were presented with a gift and beautiful card each. The cards were filled with beautiful words of thanks and our gifts were a royal seal each!!!! The gorgeous Sue Kennedy presented the gifts which had been purchased by our delightful Alison Kirkwood. As Sue was thanking us she remembered the cards! We froze as she ran to find them and then enjoyed reading them and checking out our gifts. 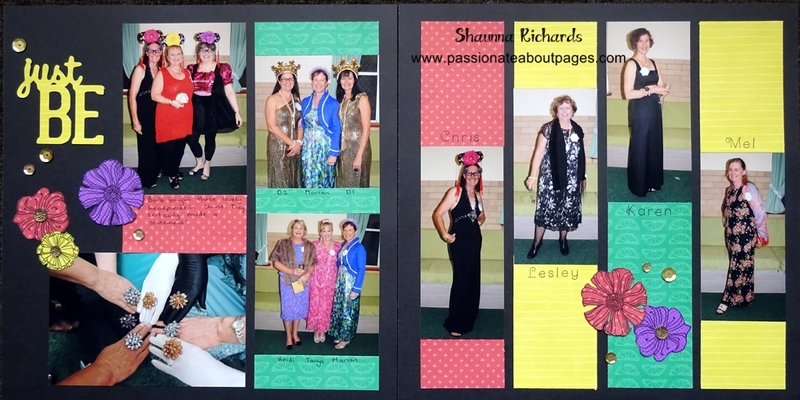 Tammy Anderson caught it all on the camera and this page is a fun layout to remember how special I was made to feel by the ladies I was supposed to be spoiling. Thankyou Duchies for my Royal seal. I love it. Taste of Summer papers (CC1038) and Stamp Set (CC1039) team perfectly with Canary, Cotton Candy and Pear cardstock. The layout is simple. 3 strips 11″ x 3 1/2″. Stamp in the same colour ink as the cardstock. Have the images close together at the bottom. Flip Flaps allow you to add extra photos without having to cover your pretty design elements. The photo mats are 3″ x 4″ – you will want 9 of them. 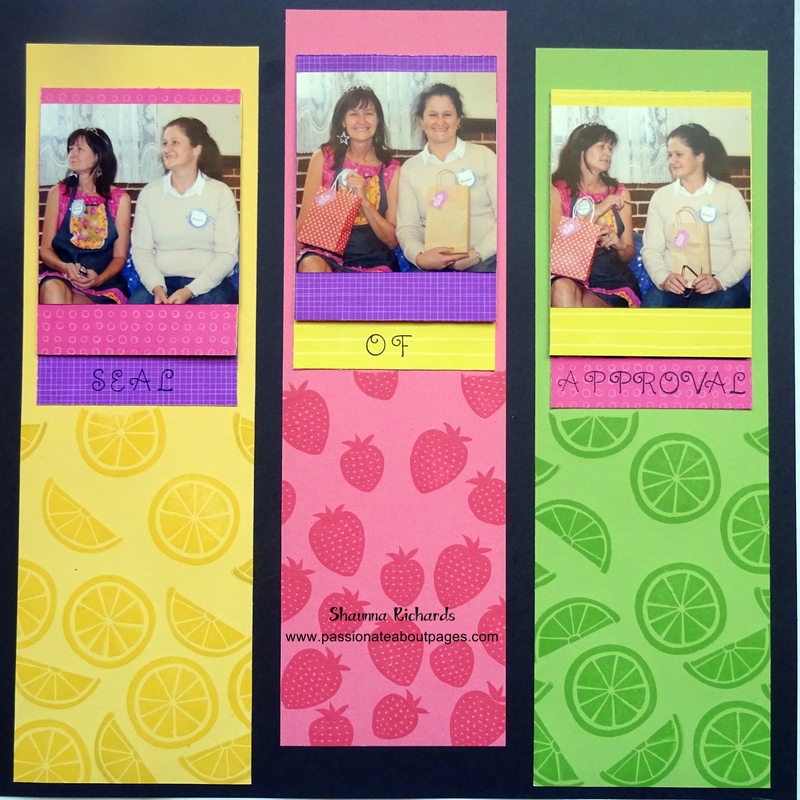 3 go on the cardstock strips and the rest go inside 3″ x 4″ Flip Flaps(Z3037) with 3″ square photos mounted. When you lift the flip flaps you see 6 more photos. 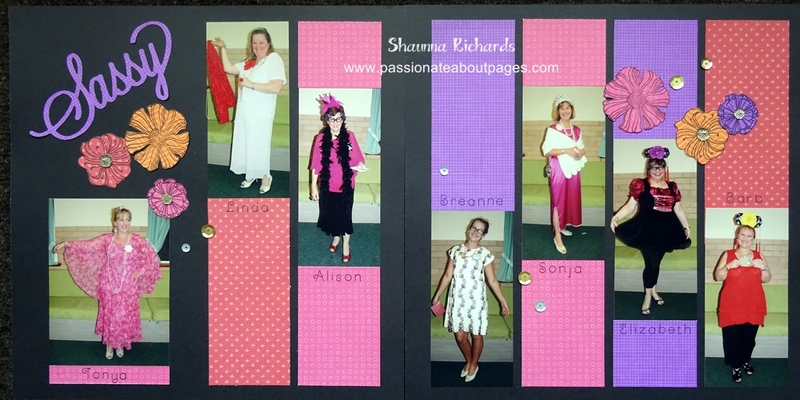 Have some fun with this layout – it’s great for all sorts of photo sequences. Remember the Taste of Summer collection is only available this month. 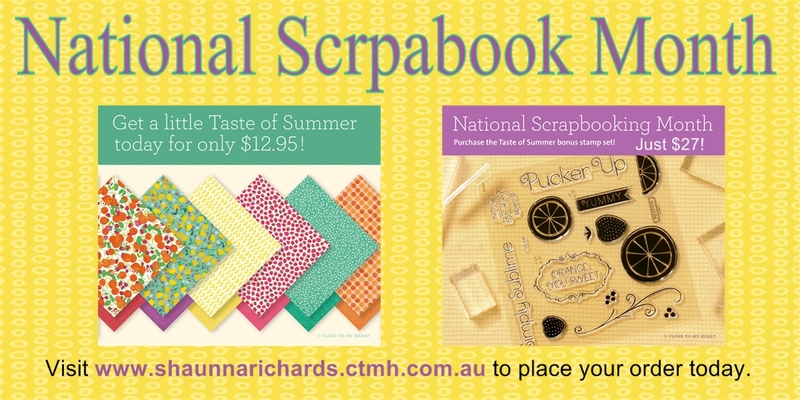 Visit http://www.shaunnarichards.ctmh.com.au to place your order. Messing around with small pieces of paper can be fun. Once again I have dived in to the offcuts in my Taste of Summer papers (CC1038). 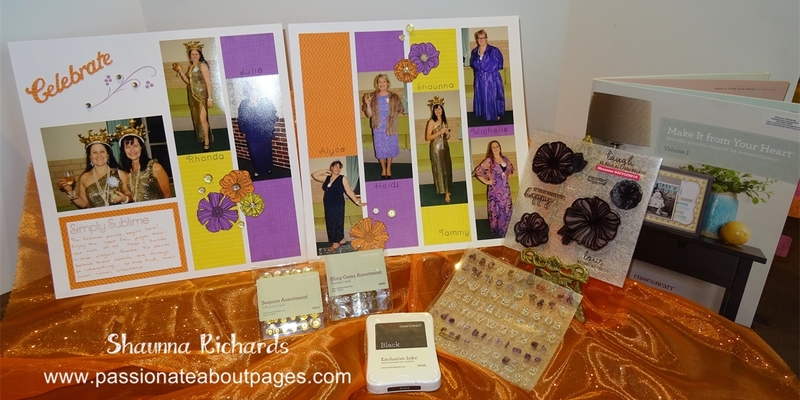 Card & Envelope Value Packs (50 of each for just $20) make card making super easy. I’ve used White Daisy (X2540) here but you can also get Colonial White (X1410) if you prefer. 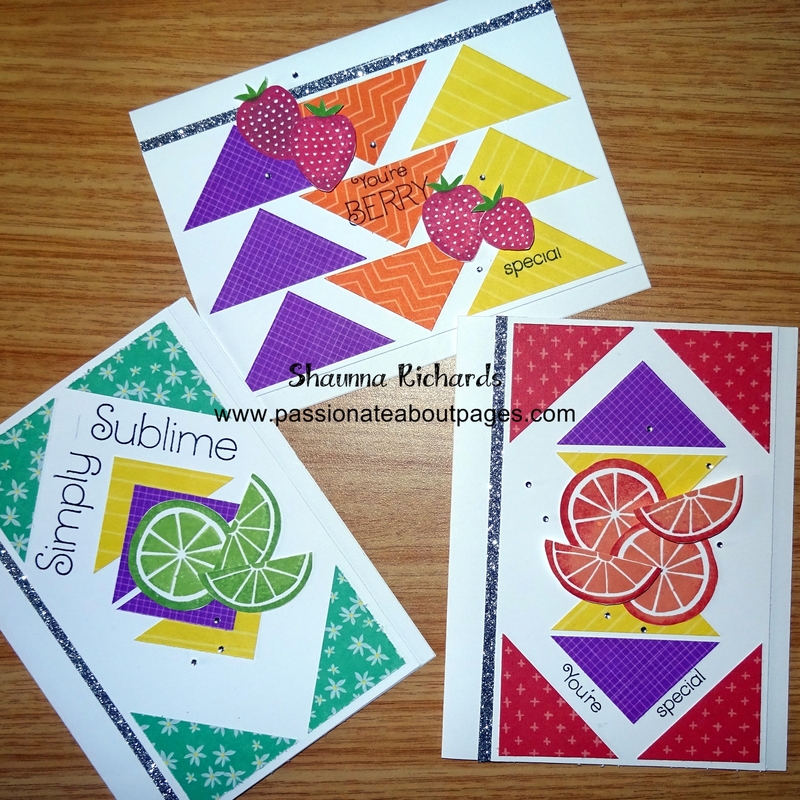 I began with 1 1/2″ squares cut in half diagonally and played around until I had some patterns I liked. I cut my Shimmer Trim in half lengthways so it is a subtle accent and then decorated with stamped fruit and captions from the Taste of Summer stamp set (CC1039). Bitty sparkles finished the designs off. I used Post It notes to mask off segments of the titles and I used the Rock ‘n’ Roll inking technique for the fruit. 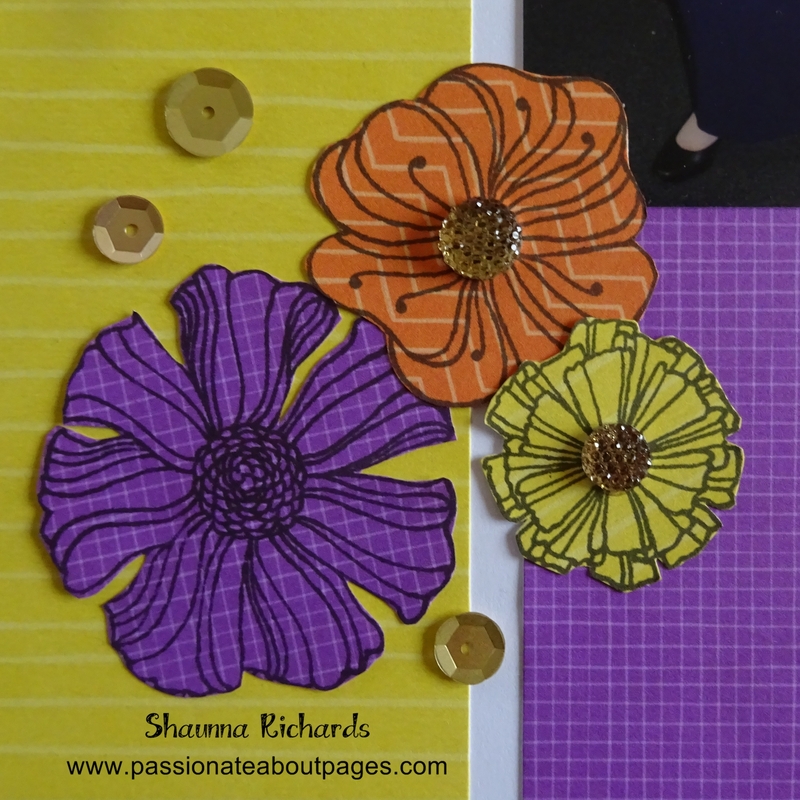 Have a play with your scraps and see what you come up with. How cute is this little gift bag made by my friend, Rose Kendell? 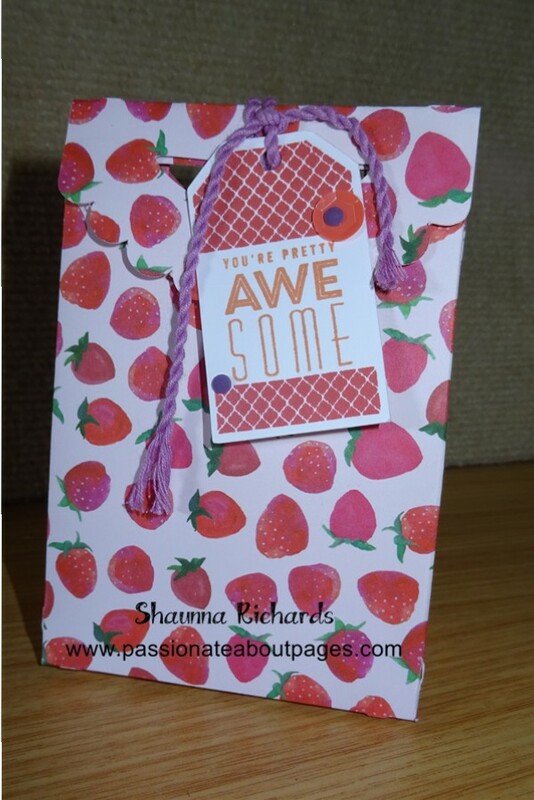 The fruity prints of the Taste of Summer papers (CC1038) are perfect for gift bags. This one stands about 5″ high. She used the Cricut Artiste Cartridge (p79 3D Object). 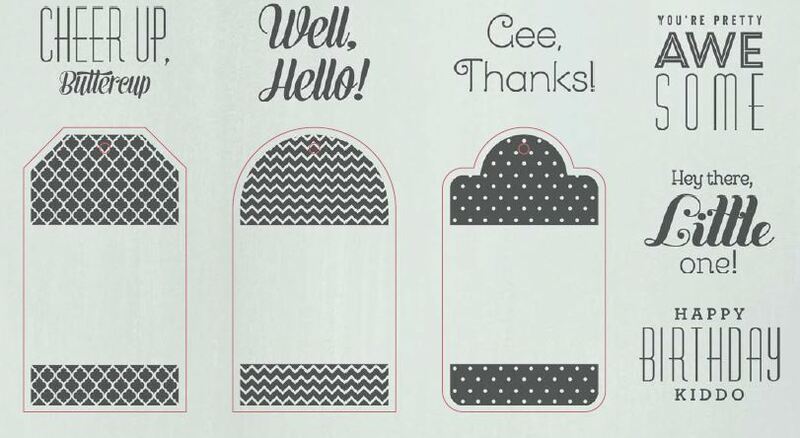 The Cricut cuts score lines making folding super easy. Glue it together with Bonding Memories (Z553) for a strong hold. 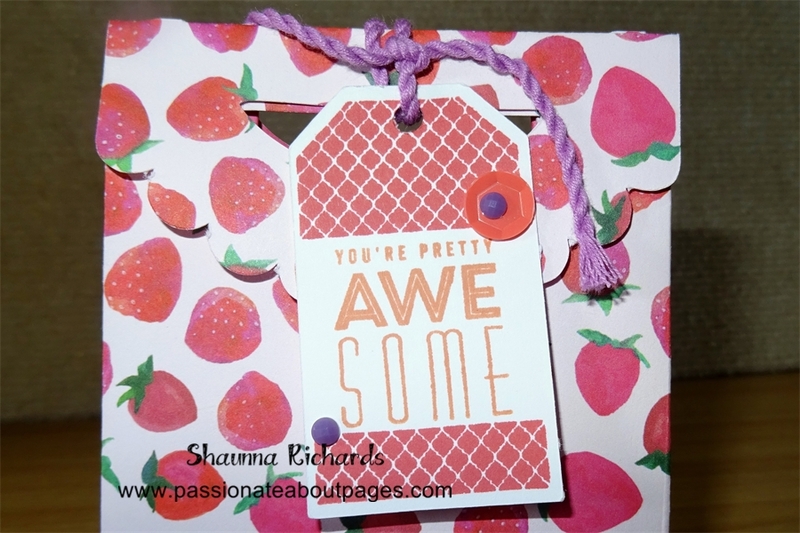 The gift tag is made using one of our NEW CTMH Hostess Rewards Stamp sets. Notice the purple bling on the tag? It’s not in our catalogue!!! Rose began with Clear Sparkles (Z1752) and coloured them in with a Shin Han Marker (Lavender Z2453). I’d love to reward you with the Tagged With Love Hostess Rewards Stamp set. Organise a gathering for a couple of friends or bring them along to one of my events and I’ll help you own this cute set. The ‘Tagged With Love’ Hostess rewards stamp can be yours with an order of $200 or more. Would you like to receive an email of my latest blog posts each Monday and Thursday? Simply click on the RSS – Posts link to the left to sign up. The Taste of Summer Papers are so bright and cheerful I just had to use them with my photos from this year’s Duchess Retreat. 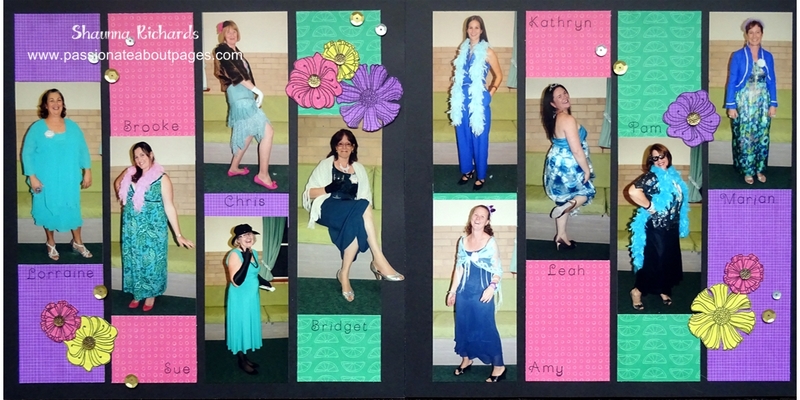 Friday night is ‘Frock Night’ at the ‘Duchess Do’ and this year we had some awesome frocks on display. 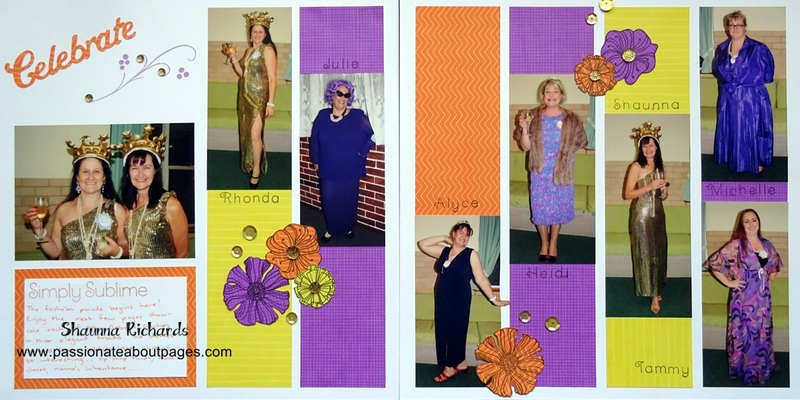 Op shops were scoured, Nanna’s closet was raided and some even found their outfits lurking in their own wardrobes!!! 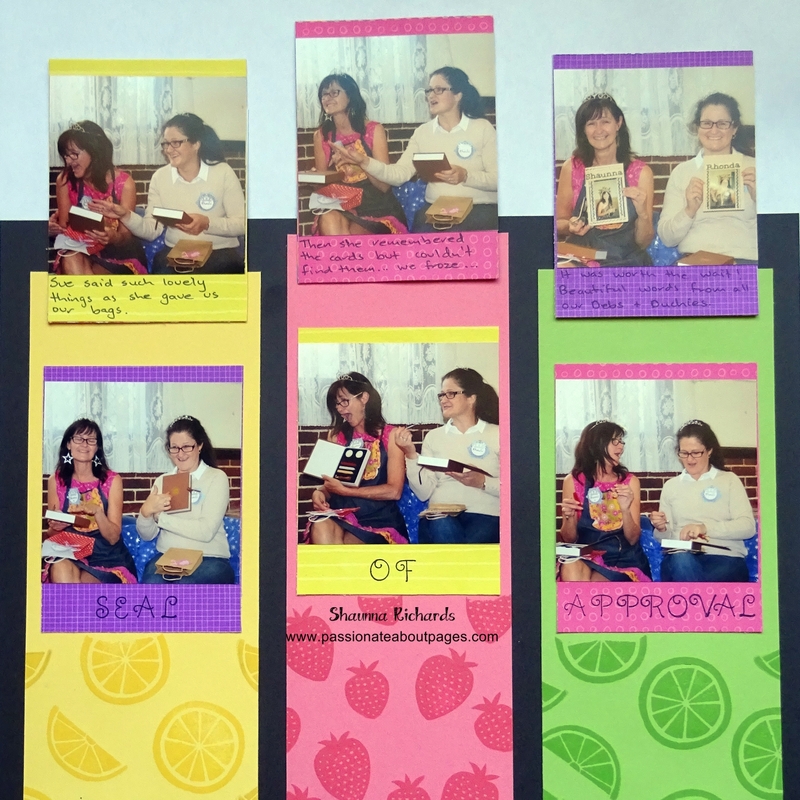 I felt I needed to honour each of our Debutantes and Duchies by displaying individual photos. Team CTMH Taste of Summer Papers and Stamp set with Make It From your Heart Vol 1 & Wavy Blooms stamps for a fun layout. I began with Layout 1 from Make It From Your Heart Vol 1. This is a super easy layout. Just trim your photos to 2 1/2″ and off you go. The pattern has photos trimmed shorter than mine but it was easy to adapt. Wavy Blooms (D1651) is a gorgeous stamp set. All I did was stamp in black ink on the patterned papers and cut around them. Gold Bling Gems (Z2023) make lovely flower centres and Gold Sequins (Z2012) complete the clustered embellishment. This layout would suit ball photos, fancy dress party photos or garden snapshots perfectly.